Sydney Swans defender Dane Rampe latching on to the footy. 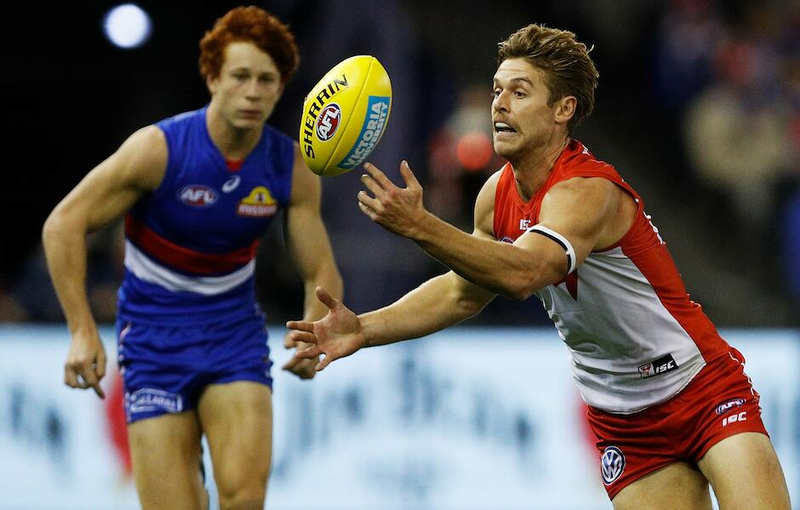 In the first edition of Opposition Watch for season 2019, Swans Media pulls back the curtains on the Western Bulldogs ahead of Saturday night. The Sydney Swans will get their 2019 campaign underway in a clash with the Dogs at Melbourne's Marvel Stadium. The Bulldogs were competitive in a five-point loss to the Gold Coast Suns in their opening JLT Community Series fixture, before they then challenged St Kilda in a 14-point defeat. Although Gold Coast recorded an 11.11 (77) to 10.12 (72) victory, the Dogs topped the Suns in disposals, clearances, stoppages, inside 50s, marks inside 50, contested possessions and tackles. The clash with the Suns also saw midfielders Jack Macrae (40 touches), Caleb Daniel (32), Lachie Hunter (32) and Marcus Bontempelli (30) all find plenty of the footy. Sydney veteran Jarrad McVeigh told media on Thursday he expected the midfield contest to decide the match, so you can be sure the Swans will have studied hard on the Dogs’ in-form on-ball contingent. Sydney Swans midfielder Josh Kennedy squeezes out a handball. The Dogs will unveil three fresh faces in top-10 draft pick Bailey Smith and recruits Taylor Duryea and Sam Lloyd. Smith’s chief strength is his ability to win the Sherrin, but the former Sandringham Dragons captain can also play at half-forward and as a hard-running backman. Duryea arrived at Whitten Oval via last October’s trade period in possession of an impressive resume, with the creative 27-year-old defender having played 118 games for Hawthorn and having won two flags. Lloyd will slot in to the Dogs’ forward line after setting sail from Richmond to the Kennel via last year’s trade period. The 29-year-old booted 69 majors across 57 games as a Tiger and has added intense defensive pressure and a knack for finding the goals to the Dogs’ forward 50. Young Swan George Hewett last year played pivotal shutdown roles on Dustin Martin, Shaun Higgins, Patrick Cripps and a host of other prolific ball-winners – and on Saturday he could add another star to the glowing list. Bullocking midfielder Macrae last year topped the Dogs’ disposal count on eight occasions and averaged 33 touches for the season. The 24-year-old also gathered 40-plus disposals on four occasions in 2018, and his 40 touches in his side’s JLT Community Series game against Gold Coast sent a formidable warning to rivals. Hewett can play as a ball-winning midfielder or at half-forward, but don’t be surprised if he’s assigned to Macrae or another gun Dog at Marvel Stadium. Sydney Swans youngster George Hewett attempting to shrug off a tackle. Young Sydney speedster Oliver Florent clinched victory for his side with a last-minute goal when the Swans and Dogs last met in Round 4, 2018. The Swans’ 2018 Rising Star champion took control of the footy at the centre of the left wing, put on the afterburners to hold off long-legged Dogs ruckman Tim English, took a bounce and nailed the match-winner from just inside 50 with less than 30 seconds on the clock. His teammates swamped him before re-setting for the final centre bounce of the game, and the celebrations then continued post-match as the Swans pencilled in their third win of the season. Lance Franklin and Luke Parker snared three goals each and Dane Rampe (23 disposals), Jake Lloyd (23) and Jarrad McVeigh (21) were influential in defence. The Brownlow votes were awarded to Parker (three), Franklin (two) and the Dogs’ Macrae (one). Star Sydney Swans forward Lance Franklin celebrates a goal in the club's most recent clash with the Western Bulldogs.